Terry Rozier’s rookie numbers didn’t look like much. I would advise you to not even look at his stats because they won’t tell you anything about the progress that the then 21 year-old guard made in the 2015-16 season. Rozier appeared in just 39 regular season games for the C’s last season, playing an average of eight minutes and taking less than three shots per game, so there wasn’t really much of a sample size. His defense, however, was promising. Brad Stevens obviously saw something because when Avery Bradley went down with an injury in the playoffs, Terry saw the biggest increase in minutes. While Rozier didn’t exactly fill AB’s shoes, his shooting percentage saw a 12 percent increase in the postseason as he played 20 minutes a game and did everything he could to contribute on both ends of the floor. His stat line was 4.8 points, 3.4 rebounds, and 1.2 assists per game and his defensive energy was key in their two wins. 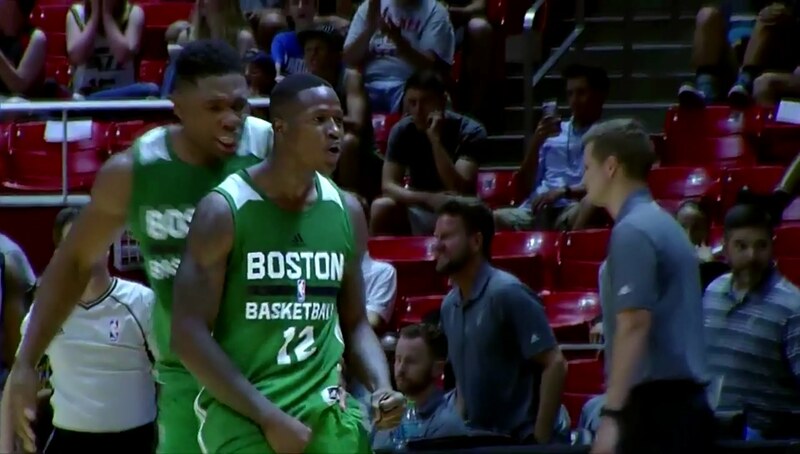 Final Terry Rozier stats for Utah summer league: 18.3 ppg, 6.3 rpg, 5.3 apg, 46.1% FG. In the Celtics’ win over the Spurs in Salt Lake City Thursday, Terry Rozier had the type of killer instinct that he’ll need to have if he wants to be the impactful player that he’s striving to be. He finished with 23 points and 6 assists and completely took over the last minute of the game to finish off a comeback. The C’s were down 86-80 with 1:06 remaining when Rozier pulled off a killer spin move around the top of the key and slashed to the hoop for an underhand layup to cut the deficit to four with 51 seconds left. After Boston got a stop, Rozier lost his defender on an in-bounds play under the Celtics’ basket and converted an easy layup off the pass from James Young. I know it’s only Summer League but it’s hard not to be encouraged by both the competitive attitude and effectiveness of Terry Rozier in these first few games. He appears to be embracing the prospect of being placed in a bigger role this year.